^^Certification : ANSI/NSF standard 42 Certified^^Filtration Method : Carbon / Charcoal.^^Filter Life : 6-months^^Filter Capacity : 500 Gallons.^^High Water Flow Rate. Removes Chlorine, Taste and Odor from Water. High Water Flow Rate provides Plenty of Water in few seconds. The Replacement Filter lasts 6-months and filters 500 Gallons of Water. Retains Minerals like Fluorine Keeping water Healthy. The Aqua Fresh WF290 Replacement Water Filter for LG LT500P / Kenmore 9890 is a high-quality water filter compatible with popular and well-established models of refrigerators. This filter transforms raw tap water into a tasty beverage. The filter provides safety against these impurities and keeps your water healthy. The filter is quite economical compared to other brands and does not compromise on quality. Chlorine or other water-hardening minerals present in tap water can cause health issues. 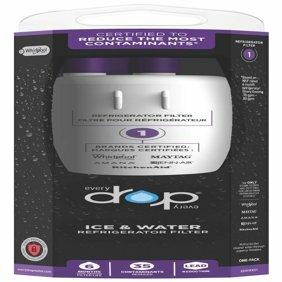 This filter clears all these impurities giving you clean drinking water and ice. It effectively cleans out chlorine, taste and odor from water providing healthy water for you. It has a high flow rate which supplies ample water in few seconds. It does not remove beneficial minerals providing healthy drinkable water. The filter has a hassle-free installation process, requiring no special tools. It is a simple push and twist procedure to secure a tight leak-free grip. The filter needs to be installed correctly so that the water gets filtered out well. To be on the safe side, it is always recommended to replace the filter after a period of 180 days for avoiding health-related concerns.